It wasn't too long before we all saw the problem. In an age of deflation a minus plus a minus equals an even bigger minus. Not a lot of incentive there. It also reflected a wider issue: the inflationary mindset of the public sector. Governments don't do deflation as a rule. Inflation is much more attractive simply because it creates the illusion of an expanding economic cake - to be divided among contesting interests - even if the real size of the cake is barely increasing. Deflation works the other way: it focuses attention on the real size of the cake and who precisely is getting what. 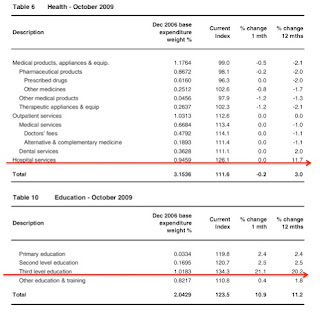 Not surprisingly then it is the public sector that is now the main source of price inflation in Ireland (witness health and education prices highlighted in the table) according to yesterday's CSO data. The private sector is the main source of deflation: witness the retail sales data also published yesterday which showed that most retail sectors are now only fractions of their size in 2005 never mind at their peak in 2007. The European Commission's latest economic forecast projects that Ireland will be the only eurozone country to experience deflation in 2010. This means that real interest rates will remain high for Irish businesses (see The 5 C's of Contraction) and that the nominal and real size of the Irish economy will continue to shrink. Nor is it just business borrowers who will face a higher interest rate hurdle, so also will the Government with it's borrowing capacity severely constrained by the NAMA gamble. If we are lucky, global recovery will drag us along with it, driven in turn by a more competitive private sector in Ireland due to lower costs of doing business (one benefit of deflation). Still, by the time it's over, all of us - public and private sector alike - will have had to permanently adjust our 'inflation-adjusted' mindset.